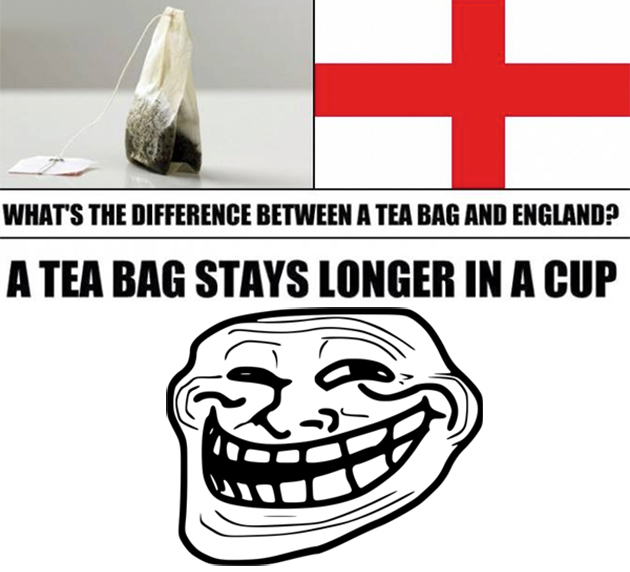 What's the difference between a tea-bag and the England football team? The tea-bag stays in a cup longer! Heard what Spain's coach Vicente Del Bosque said to his charges after two shock losses? "Don't worry, we still have options: aisle or window seats." 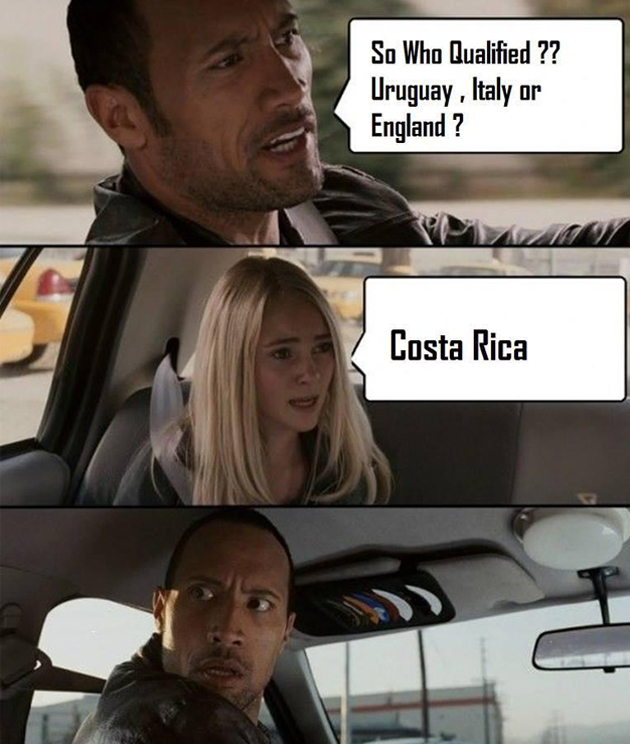 With the World Cup entering its final stages, the jokes are flying as fast as goals, helping relieve tension and - for fans of the 24 teams already out - the abject misery of elimination. 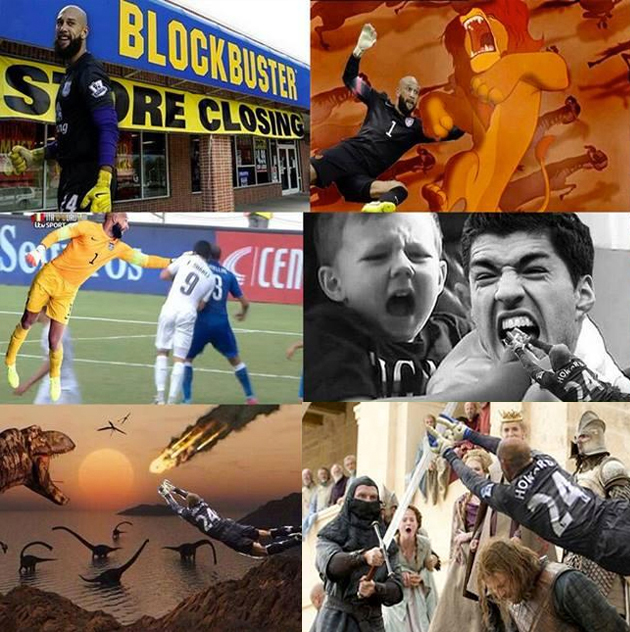 Be it on, off or thousands of miles away from the pitch it has been another tournament packed with hilarity. The inglorious early exit of supposed European heavyweights England, Spain, Italy and Portugal brought heartache in those nations at first, then a wave of self-deprecating humour. One photo doing the rounds shows their four planes lined up in blue sky with the caption: "Permission to land?" England fans showed a fine ability to laugh at themselves, chanting during their final match the self-parodying song from a Monty Python film: 'Always Look On The Bright Side of Life'. One fan, who flew to Brazil after England had been knocked out to see a dire 0-0 draw with Costa Rica, held up a banner mimicking a well-known credit card ad - "Flights to Rio: 1,200 pounds. Enjoying the ambiance: 2,000 pounds. Accommodation: 2,000 pounds. Arriving after elimination: priceless." 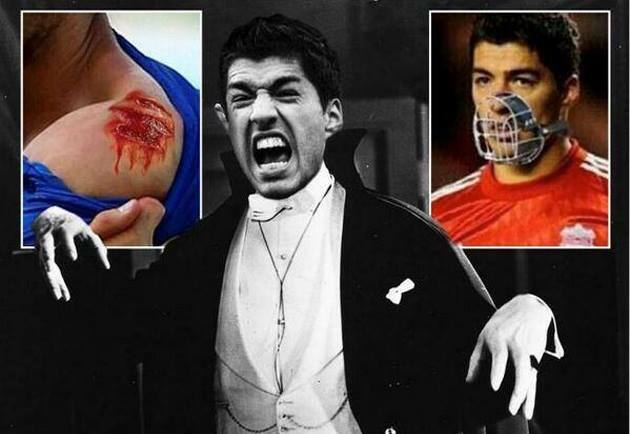 Naturally, the tournament's main talking point - Uruguay striker Luis Suarez's ban for biting - has spawned a vast array of doctored images depicting him variously wearing a dog-cone round his neck, a Dracula outfit, or a Hannibal Lecter mask. Tourists in Rio de Janeiro queued up to place their necks or arms inside his open mouth on a larger-than-life Adidas ad photo of Suarez's head. Adidas, perhaps embarrassed by negative associations round an ad made before the incident, took it down. 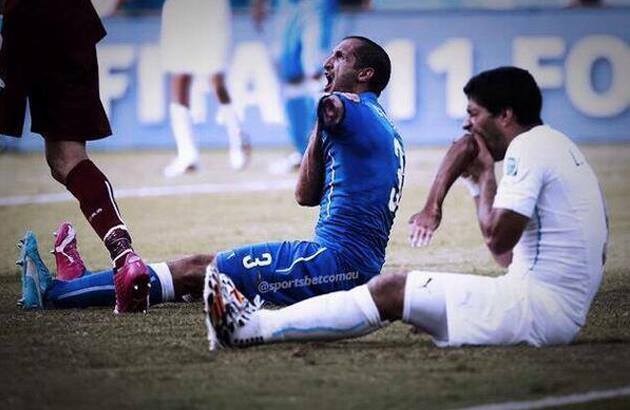 A modified version of the Panini sticker of Suarez's victim, Italian defender Giorgio Chiellini, has been circulating with a chunk missing. 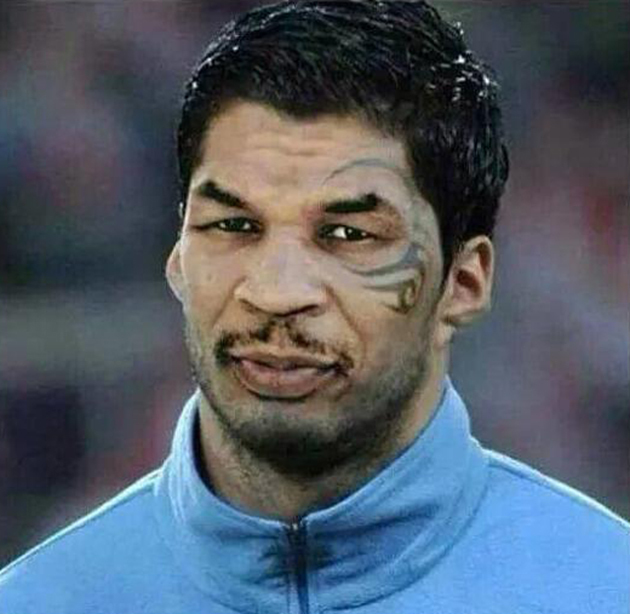 Yet the Uruguayan, who has apologised for the incident which earned him a four-month ban, is by no means the World Cup's only pantomime villain. Netherlands forward Arjen Robben, though a hero to Dutch fans for his goals and tricks, has become a target for many due to perceptions of diving and feigning fouls. 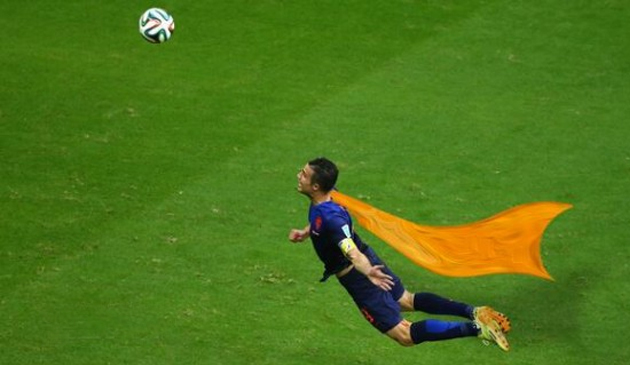 The fall that gave the Netherlands a penalty earning them a last-gasp 2-1 win over Mexico has earned particular notoriety. A plethora of internet users have lampooned Robben as lifting an Oscar for Best Actor, competing in Olympic diving, and plunging arms-flailing off the cliffs of Acapulco. The sagas over Suarez and Robben have largely deflected attention from the man many fans most love to mock, Sepp Blatter, head of the sport's world governing body FIFA. One company in England, where he comes under constant fire from media over his management of FIFA, launched a new online game in which the player hurls gold, money and riches into the mouth of a guffawing Blatter-like persona crying "Give me more!" Reporters at FIFA's briefings have been asking whether Blatter's low profile here in Brazil is to avoid being booed in public. It's an "editorial" policy, officials say. Once they take the field, it's a deadly serious game for players, and few would dare joke around. The United States' Jermaine Jones drew a few unintentional laughs, however, when he clattered into the referee and fell flat on the floor during one game. Germany's Thomas Mueller initially had spectators chuckling at him when he stumbled to his knees during a free-kick routine against Algeria. He had the last laugh, though, revealing it was a deliberate trick to throw defenders off guard. The question is, do we believe him? "In training it always worked," team mate Toni Kroos said. "But it looks like crap when it doesn't." Argentina's Ezequiel Lavezzi was lucky his boss saw the funny side of things, instead of fining him, after he nonchalantly squirted water over coach Alejandro Sabella on the side of the pitch. "Players like Lavezzi are always very positive, because they keep players happy," Sabella said. Mexico coach Miguel Herrera has appeared blissfully unaware of the smiles his manic-looking celebrations have caused, turning him into an internet sensation during the World Cup. After the Netherlands eliminated Mexico, a politically incorrect KLM airline Tweet read "Adios Amigos" with a caricatured photo of a moustachioed Mexican man in a sombrero. The outrage was swift, bringing a KLM apology and a vow from Mexican actor Gael Garcia Bernal never to fly with them again. But back to the European flops. There was a touch of high art in one jest at Spanish coach Del Bosque's expense, his head super-imposed over Edvard Munch's 'The Scream' painting. And English satirical magazine Private Eye was so sure of what was coming in Brazil, even before the games had begun, it printed a front-cover showing the players alighting from their plane while the pilot asks: "Shall I keep the engines running?"